There’s something about the start of a new year, a new season, or even a new chapter in our lives that causes us to hope for positive change. Oftentimes however, our past failures, mistakes, and even past sins can leave us in wonderment of whether or not we have what it takes to succeed in the things we want most for our lives – whether is it in business or relationships. We find ourselves struggling to overcome our fear of failing and we worry about repeating our past failures or making the same mistakes again. We live in uncertainty of whether or not we will fall back into destructive cycles that lead us into sin again. When a person lives in fear of these things and worrying about their future, they strip faith from their thinking (“…the conviction of things hoped for and the evidence of things not yet seen”). It robs them of the strength they need to press through whatever stands in their way of being successful. Instead of being filled with expectation of seeing their goals and aspirations fulfilled, and their future at its best, they live in constant anxiety and uncertainty, and experience the negative emotions that come from embracing fear and worry over that of faith and hope. The result of this faithless worrisome mindset causes those who live in it to entertain thoughts that ultimately affect their determination to be successful in what they want to accomplish. A mindset rooted in worry robs them of the strength to persevere under hardship, trial, and tribulations; and, ultimate it affects the decisions they make (“There is a path before each person that seems right, but it ends in death”). When we willfully choose to worry, we run the risk of being paralyzed and being unable to make important decisions in our lives or pursuing a course of action that is in our best interest. When we live in a place of fear and worry, we often shy away from commitment and rob ourselves of God’s best for our lives both in our personal and business success, and even in relationships. 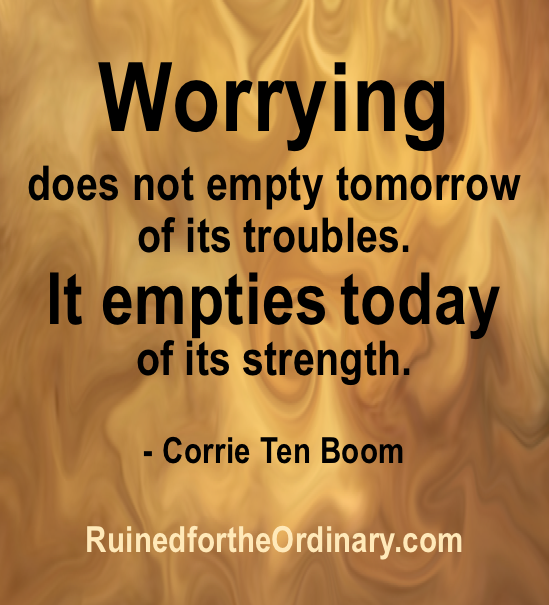 Don’t let fear or worry control your life. It will rob you of your strength to succeed in those things that matter most to you. Allow faith, hope, and love to dominate your life, and fear and worry will not be able to have influence over your life.